Folk Music Society of N.Y., Inc.
At the January 2013 meeting the FMSNY Executive Board voted to suspend our annual Eisteddfod festival for 2013 and reintroduce the Fall Weekend, which was one of the club’s yearly highlights before being combined with Eisteddfod in 2009. The Fall Weekend will, as always, feature the kind of program and performers that have long demonstrated the value of Pinewoods membership. Meanwhile, the Board’s Eisteddfod Committee will be working diligently to reimagine the festival so that when we bring it back in 2014 it will be attractive to a wider audience. Those who have attended Eisteddfod know what a great contribution it has made to the folk music community in terms of education, entertainment and fellowship. Our goal is to find a way to spread that message and draw an audience large enough to make the festival self-sustaining into the indefinite future. 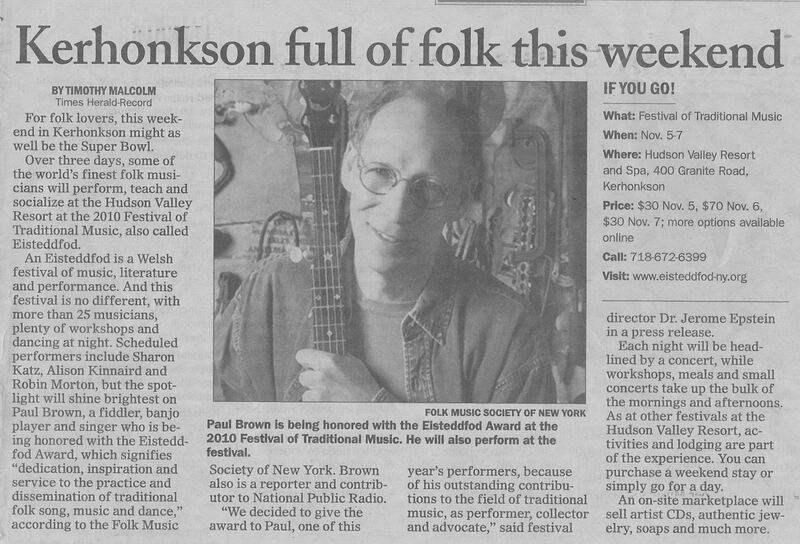 The information below is from November 2012 -- just to give you an idea of what the festival is like. Eisteddfod-NY is proud to host traditional music and song from Brittany, England, Hawaii, Ireland, Macedonia, Scotland, Serbia, and of course America — Appalachia, New York State, and more — along with contemporary songs, sea shanties, Gospel and Sacred Harp, and blues. As always, there will be plenty of opportunities for everyone to play and/or sing in the participatory workshops and informal jams. Come listen, come play and sing, come learn. Can you help us by posting or giving out flyers? Print them from the download available above or E-mail us with your mailing address and we'll send you what you prefer. tickets are available either with accommodations (blue section) or without (purple section). Note: through several generous donations, we are offering a very reduced group "friends" rate for group reservations by those age 21 through 35. These "friends" rates are for the entire festival including all all programs, lodging, hotel facilities, and meals Friday dinner through Sunday Lunch. See the yellow section below. Kids, accompanied by adult: under 9 free. 9-18 and students 22 and under, half the above admission prices. Please contact us for detailed kids' meal prices. Day tickets will be available at the door. Here's how we arrange the Eisteddfod program: we contact performers, ask them so make suggestions, then try to work out who will do what and with whom. Our overall endeavor is to have some workshops that are participatory (for example, songs with choruses, old-time jamming; some workshops that cover a particular area or type of music (blues, Sacred Harp, Scotland, etc. ); and some that are "mini-concerts' so people can get a taste of what individual performers do. There is also a campers' concert, for which anyone can sign up to perform. In the past, we've had some great synergy between performers — people who had never met before but found community in their music. We hope that everyone who comes will take the chance to play, sing, and learn. Staff Concert: 8:00 – 10:30 p.m.
Breakfast: 8:00 – 8:45 a.m.
Workshops: 9:30 a.m.– 12:45 p.m.
Workshops and Camper Concert: 2:15 – 6:30 p.m.
Dinner: 6:45 – 8:15 p.m.
Workshops: 9:00 a.m. – 12:15 p.m. Lunch: 12:30 p.m. – 1:45 p.m. The Marketplace will offer CDs etc. from the performers and others, plus information on local organizations. We also hold a Silent Auction to benefit our Scholarship Fund. Full Page $120 4-5/8" 7-3/4"
Half Page $60 4-5/8" 3-3/4"
Quarter Page $30 2-1/4" 3-3/4"
Eighth Page $15 2-1/4" 1-3/4"
Sizes are actual print size for camera-ready copy and will be reduced if oversize. Preferably, ads should be supplied on disk or via email, in MS Word, InDesign, PDF, or TIF format or laid out camera-ready; delivered and paid before the deadline. The Editor has no facilities for doing artwork and ads which are sloppily laid out will be refused! Ads are subject to the approval of the Advertising Committee. Page or position placement cannot be guaranteed. A FAQ page for 2012.